We just had Christmas recently. No, it was Easter. Simply put, time flies and man is not able to keep track of it. However, there is a date, or rather a date in May on Sunday, which we can not overlook. This year this date is the tenth of May and it will be the second Sunday of the month, Mother’s Day. In our family, we celebrated Mother’s Day but we ignored “International Women’s Day.” We just did not accept this communist substitute for Mother’s Day. It was, however, my father, who even when I was little, bought something for me that I would give to my mother. Later, my younger sister Renatka would go shopping with us. Of course, we also went to cemeteries with flowers for our grandmothers. I can still remember my father’s mommy very well; she died when I was seven years old. I could not have meet my second grandmother; my mother orphaned when she was 16 years old. 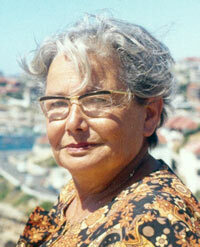 She lived in Prague alone and her closest relatives lived in Plzen (a town in the Czech Republic west of Prague). My mother told me that when she was already an orphan, she found a poem in a newspaper about mothers. She cut it out and put it in her diary, and when I was allowed to look through her old diaries, I would always find it there. Then, in this unworthy year 1968, I left the Czech Republic with my husband and our six-year-old son. It took six years before my mother was able to visit us. I think, I did not fully realize, what this trip meant for her. She had never flown in an aircraft and did not speak a word of English. After many years I realized that this infinite love of a parent supported her during this journey. When she was allowed to fly again, I was already an anchor for the Czech broadcasting in Sydney. Comrades of the StB (Czech secret police) called for my mother to remind her about the nasty work I was doing in Australia against the Socialist Republic. They told my mother that it was her obligation to arrange my return back home and that they would call her again to inquire about the results. Poor mother thought of that interview throughout the whole time of her visit. The comrades never called her again, but they certainly felt that malicious joy about how they spoiled her visit. Well, I will return back to Mother’s Day, but not quite. And I can also add what she wrote to me in her diary. It does not matter how old we are, we will always miss our moms. 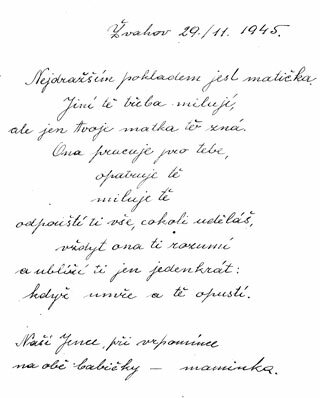 My mother and I had never spoken about that poem from the newspaper, but when I flew to Prague in 1995 to say goodbye to her, my sister and I came across the poem again. It was still pasted in her diary. 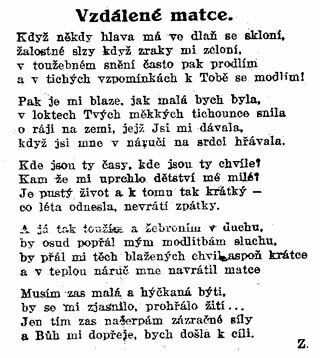 So for all of you readers, who have mothers far away or already in some distant world, I attached a copy of the poem from an unknown author from some newspaper in Prague. Tento článek byl v Pozitivních novinách poprvé publikován 10. 05. 2009.